Background: To know the ability of a compound to penetrate the blood-brain barrier (BBB) is a challenging task; despite the numerous efforts realized to predict/measure BBB passage, they still have several drawbacks. Method: The prediction of the permeability through the BBB is carried out using classification trees. A large data set of 497 compounds (recently published) is selected to develop the tree model. 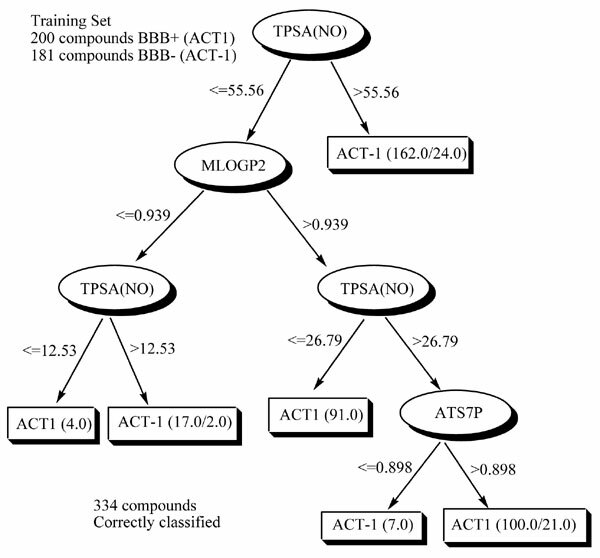 Results: The best model shows an accuracy higher than 87.6% for training set; the model was also validated using 10-fold cross-validation procedure and through a test set achieving accuracy values of 86.1% and 87.9%, correspondingly. We give a brief explanation, in structural terms, of how our model describes the passage of molecules through the BBB. Additionally, the obtained model is compared with other approaches previously published in the international literature showing better results. Conclusion: Finally, we can say that, the present model would be a valuable tool in the early stages of drug discovery process of neuropharmaceuticals. Blood-brain barrier, classification tree, molecular descriptor, neuropharmaceuticals, quantitative structure-activity relationship, WEKA.